"Jason Patrick" redirects here. For the American militant, see Citizens for Constitutional Freedom. 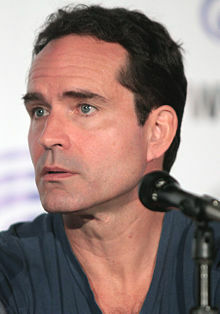 Jason Patric (born June 17, 1966) is an American film, television and stage actor. He is known for his roles in the films The Lost Boys, Rush, Sleepers, Geronimo: An American Legend, Your Friends & Neighbors, Narc, The Losers, The Alamo, and Speed 2: Cruise Control. His father was actor/playwright Jason Miller and his maternal grandfather was actor Jackie Gleason. Born in Queens, New York, the son of the late Academy Award-nominated actor and Pulitzer Prize-winning playwright Jason Miller (born John Anthony Miller Jr.) and actress Linda Miller (born Linda Mae Gleason), his maternal grandfather was actor/comedian Jackie Gleason. His half-brother is actor Joshua John Miller. His ancestry is mostly Irish, with some German. Growing up in Upper Saddle River, New Jersey, he attended schools such as Cavallini Middle School and the all-boys Catholic school Salesian Roman Catholic Don Bosco Preparatory High School (Ramsey, New Jersey). In California, he attended Saint Monica Catholic High School (Santa Monica, California). He appeared in high school productions of Dracula and Grease. After graduation, he was cast in the television drama Toughlove with Bruce Dern. The following year, Patric was cast in Solarbabies alongside Peter DeLuise, Jami Gertz, Lukas Haas, James LeGros and Adrian Pasdar. Within a few years, Patric would reunite with Gertz in The Lost Boys and After Dark, My Sweet with Dern. He co-starred with George Dzundza and Stephen Baldwin in The Beast. In 1993, he starred alongside Gene Hackman and Robert Duvall as 1st Lt. Charles B. Gatewood in the movie Geronimo: An American Legend. His scenes in The Thin Red Line were cut before the film's release. He appeared in the Alec Baldwin film The Devil and Daniel Webster, which was shot in 2001, and released in late 2007 as Shortcut to Happiness, but turned down the lead role in The Firm (1993), which went to Tom Cruise. He garnered excellent reviews for his performance as an undercover narcotics officer in Narc (2002). In 2005, Patric appeared on Broadway as "Brick" in a revival of Tennessee Williams' Cat on a Hot Tin Roof, opposite Ashley Judd, Ned Beatty and character actress Margo Martindale. He next appeared on Broadway opposite Brian Cox, Chris Noth, Kiefer Sutherland and Jim Gaffigan in a revival of his father Jason Miller's play, That Championship Season, which began previews on February 9, 2011 and closed on May 29, 2011. The play (written by Jason Miller) debuted in 1972, and won, among other awards, the Pulitzer Prize and the Tony Award. In 2012, he began filming the Civil War film, Copperhead, but several weeks into the shoot, he was removed from the project by the director, Ronald F. Maxwell for "failing to take direction". His replacement was Billy Campbell. Patric began dating actress Julia Roberts days after she canceled her wedding to Kiefer Sutherland in June 1991. Patric dated Danielle Schreiber off-and-on for approximately 10 years. During the relationship they conceived a son through in vitro fertilization. Patric and Schreiber separated in May 2012. Schreiber's attorneys argued that, under California law, Patric was a sperm donor as Schreiber and Patric had not married and the conception of the child was by artificial means, and therefore Patric has no custody rights to the son. Patric has been pursuing changes to the law that bars his parental rights. Patric then sued for parental rights over the child, but lost the case at the trial court level. The Court of Appeal of California, however, also ruled that the California Family Code did not preclude him from establishing that he was presumed a parent based on his post birth conduct. The case was sent back down to the trial court level, and in late 2014 he was recognized legally as the father of his son with the court granting him parental rights. Following his initial loss in trial court, he lobbied the California legislature to give parental rights to sperm donors. ^ a b Feldberg, Robert. "Jason Patric stars in his father's hit play, 'That Championship Season'" Archived 2011-07-14 at the Wayback Machine, The Record (Bergen County), February 13, 2011; accessed February 22, 2011. "The money from That Championship Season enabled the family, which included Patric's brother and sister, to move to Upper Saddle River and a five-bedroom house on a large piece of land.... Patric (his given name is Jason Patric Miller Jr.)[dubious – discuss] attended Cavallini Middle School, and then Don Bosco Preparatory High School in Ramsey." ^ "Geronimo' Co-star Keeps A Low Profile". Orlando Sentinel. Retrieved 2010-12-12. ^ "Amateur Night in Dixie: Cat Proves It Has Nine Lives", villagevoice.com; accessed February 4, 2016. ^ "Cox, Gaffigan, Noth, Patric & Sutherland to Star in That Championship Season". ^ O'Connell, Sean (June 6, 2012). "Billy Campbell Replaces Jason Patric On Civil War-Era Copperhead". CinemaBlend.com. Retrieved April 29, 2013. ^ Dargis, Manohla. "Movies: About Jason Patric". The New York Times. ^ Larkin, Mike (November 28, 2012). ""Sperm donor" Jason Patric tries to get legal access to see his son with ex ... but law may stop him". Daily Mail. ^ "California Court of Appeal ruling". leagle.com. Retrieved June 17, 2015. ^ Rosenhall, Laurel (August 14, 2013). "California Assembly panel holds sperm donor bill sought by actor Jason Patric". Sacramento Bee. Archived from the original on August 17, 2013. ^ Andreeva, Nellie (February 4, 2016). "Jason Patric To Star In 'Wayward Pines' Season 2 On Fox". Deadline. Retrieved February 4, 2016. This page was last edited on 21 March 2019, at 14:37 (UTC).